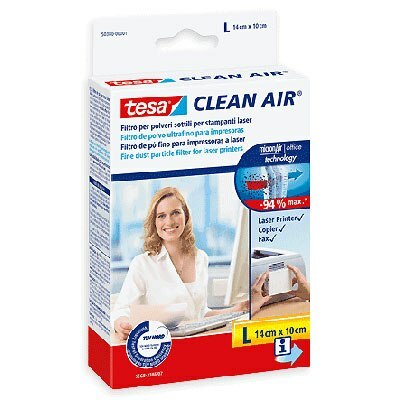 FILTRO TESA CLEAN AIR PER STAMPANTI LASER E FOTOCOP. M 14cmx7cm 50379 PZ1 - Il Papiro Web S.r.l. 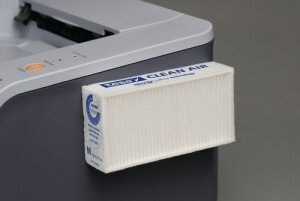 I FILTRI TESA CLEAN AIR PER STAMPANTI LASER, FAX E FOTOCOPIATRICI ASSICURANO ARIA PULITA E SICURA SUL POSTO DI LAVORO. 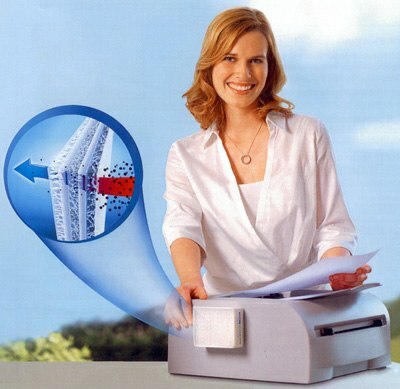 FILTRAGGIO TOP-QUALITY GARANTITO - FINO AL 94% DI POLVERI SOTTILI EMESSE DA STAMPANTI LASER, FAX E FOTOCOPIATRICI CATTURATO - OTTEMPERA AL D.LGS. 81/08 EX ART. 36 LEGGE 626/94 - MICRON AIR OFFICE FILTER TECHNOLOGY: TECNOLOGIA BREVETTATA, TNT IN TRIPLICE STRATO CARICATO ELETTROSTATICAMENTE. - CERTIFICAZIONE EUROPEA TUV NORD. - EFFICACIA: PER 12 MESI 0 70.000 STAMPE (STICKER PER DATA DI SOSTITUZIONE INCLUSO NELLA CONFEZIONE).